One thing I love a lot is false lashes. I wasn't blessed with long lashes so to get that fluttery look I have no choice but to wear lashes, no "lengthening" mascara works on my lashes so it's the way too go for me. 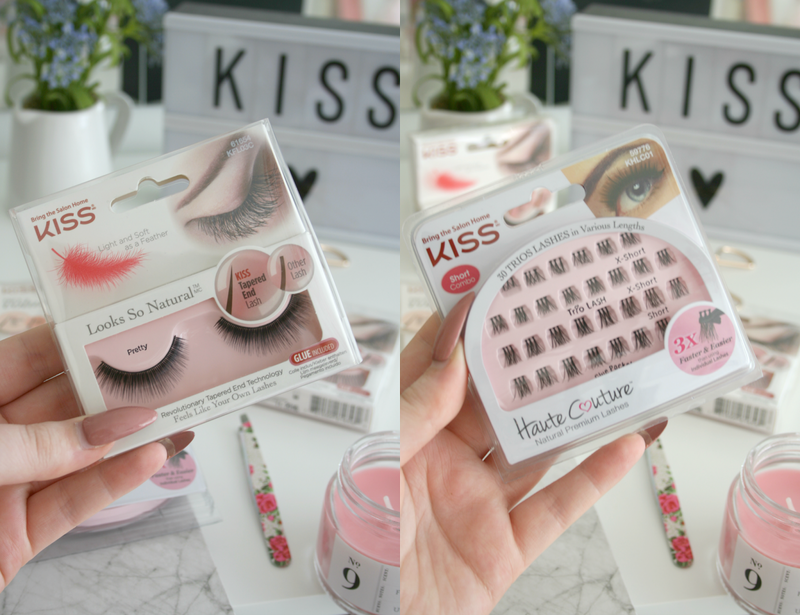 Recently a few different styles from Kiss Cosmetics came through my door and I was so excited to try them out. I received three packets of Strip Lashes* and a packet of Individual Lashes*. 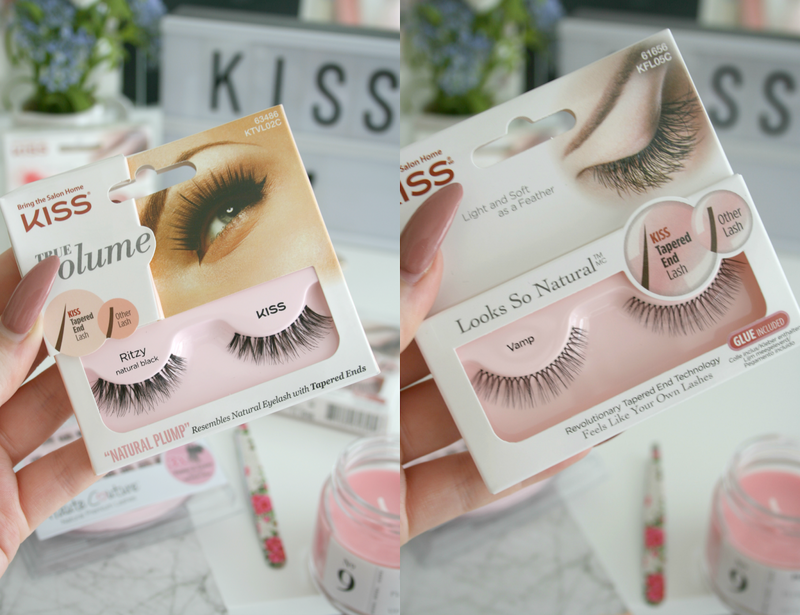 I have tried numerous amount of lash brands but I'm almost 100% sure this was my first time trying out the Kiss brand so of course I was excited to see how they would last up against some of my favourites. My favourite out of them all are the Ritzy Strip Lash*. How absolutely stunning is this style of lash, I have worn these so much since getting them and I'm obsessed with the look they give you! Something I really love about these and all the other strip lashes I received from Kiss is how the band is basically non-existing. Theres nothing I hate more than a big thick band on lashes as it just makes life that little bit more difficult. These however blend seamlessly to your lash line and you cant tell you're wearing false lashes. The Vamp Strip Lash* is a little more natural looking, they almost give you that wide awake look to your face. I do love these types of styles for when I'm doing no makeup makeup or when I'm doing a dramatic lip and want all the focus to be on that. Again the band of the lash is practically invisible. Each set includes a little tube of adhesive and I must say I'm really in love with it, it keeps your lashes on all day and if you're careful removing eye makeup you can wear these for a few days before you have to take them off. The Pretty Strip Lash* are a little more dramatic than Vamp but still keeps it looking natural adding a slight bit of drama. What I really like about these is as advertised they have a tapered end making the lashes look a bit more natural rather than having them just continuing at the same length and then just stopping. Just like the other three these are really light and you don't feel like you're wearing anything on your eyes which I really like. The band is slightly bigger and visible on these but it's still thin enough that you cant really see once applied. And finally my current obsession thats been going on the past few months Individual Lashes! I was so excited when I took the Kiss Individual Lashes* out of the package I received as I honestly cannot get enough of individual lashes right now. Something I love about these is they're in threes meaning it's easier and much quicker to do your lashes as you don't have to go one by one. Like every individual lash there isn't much of a strip on these and the little that there is disappears as soon as you apply it. Again these also come with a little tube of adhesive. Something I thought was really clever is the packaging, where the actual lashes are they've added a "Glue Pocket" for you to pour the glue into to make it easier when you're applying them. I think this is such a great idea because I'm constantly ruining palettes etc with lash glue and find this to be so handy. All in all I'm obsessed with every set of Kiss lashes I received. Ritzy is definitely my favourite style and I can see myself stocking up on this style because it's just so gorgeous! A set of Kiss lashes will set you back only €7.49 which I think is such a great price, especially because they're so easy to wear and of course you can re-use them once you take care of them. Have you tried any of the lashes by Kiss? *This post contains PR samples, all opinions are 100% my own. For more information please see my disclosure here.